This urban oasis is a major beacon for birds; more than 200 species have been recorded here! Stop by the John A. Anderson Environmental Education Center to check out the exhibits; educational programs and to pick up an interpretive booklet. A habitat restoration project at this county park was completed in 2012, which made this site even better for wildlife and wildlife watchers. Nonnative plants were removed and the boardwalk areas were replanted with native trees such as bald cypress, American elm and swamp bay. The large maple swamp and associated hardwood hammocks at this park are laced with boardwalks and trail loops. Take a stroll along the aptly-named Maple Trail and Oak Hammock Trail to search for up to 25 species of wood-warblers in spring and fall; Black-throated Green Warbler can be found in winter. Waterbirds like Pied-billed Grebe, Anhinga, Little Blue Heron, White Ibis, Wood Stork and Mottled Duck line the canals, borrow pit and shores of Sawgrass and Arrow Lakes; Green Heron, Limpkin and Black-necked Stilt occur here too. 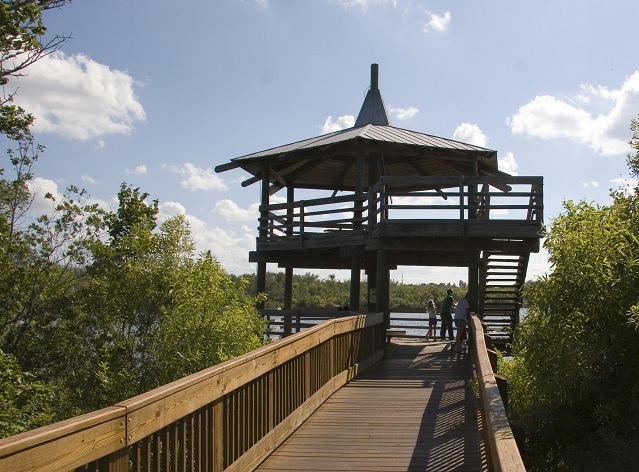 The Sawgrass Trail leads to a covered, two-story observation deck on Sawgrass Lake where visitors can look for alligators, turtles, and more. Short-tailed Hawk are spotted fairly regularly here, so remember to look up often.